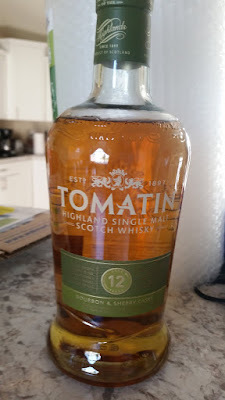 Part 1 of my birthday goodies this year, Tomatin 12 Year Old is the non-Islay Single Malt I've been looking to get stashed in my liquor cabinet and I was eager to give it a taste. Turns out it's hook, 'the softer side of the Highlands' is well earned, because this single malt wasn't the ride I was expecting and was an entirely pleasant experience to boot. Doing some digging on the old interwebs, it looks like the distillery opened for business in 1897- though apparently cattle drivers would buy from a local still as far back as the 16th Century. It's had a few ups and downs over the years- it went bankrupt in 1906, reopened in 1909 and lasted all the way until 1986, when it was brought by a Japanese conglomerate that's been running the place ever since. The distillery is about 25 minutes from Inverness which places it firmly in the Highlands region of Scotch Whisky. Color: Straw gold is probably the best description. It's not dark enough to be amber/honey, but it's not light enough to be yellow/pale yellow. Nose: The aroma is unusual, almost astringent- apples or pears seemed to be prominent- some kind of tree-grown orchard fruit for sure. There's some kind of spice underneath- I want to say nutmeg, but I'm not sure that's right either. In a sentence: this smells like fall. Body: It's sweet and spicy- the viscosity is nicely balanced- it's not heavy and syrupy and it's not weak and watery either. You get a rush of fruit followed by the spice hitting your tongue. Finish: If there's one thing to criticize here, it's the finish. The after taste lingers longer than it should and the warming is... nothing that special. It's gentle and general.